Brandt whiteware was promoted on the European market in four award-winning TV commercials in September 2000. The ads were prepared in France for TV viewers in Belgium, the Netherlands, Poland and the UK. 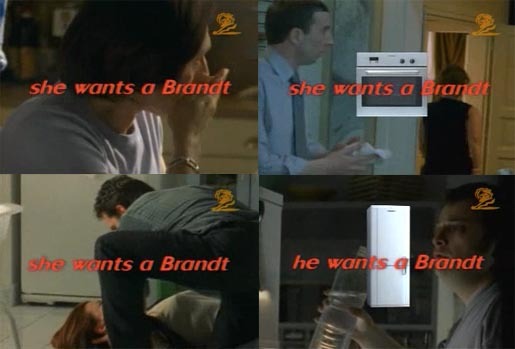 Each ad finishes with the tagline, “He/She wants a Brandt”, or, in French, “Il veut un Brandt”. In the kitchen a couple are sharing the preparation of their meal. The woman is using a fork to puncture the sausages before placing them in the frying pan. When her husband turns his back she reaches over behind the dishwasher, pulls out a hose and proceeds to puncture it with her fork. Water goes everywhere. The man quickly reaches over, opens the door and turns the water off at the wall. “Honey!”, he says. She grunts and pulls away. The super: “she wants a Brandt – Brandt. The Brandt campaign was developed at advertising agency CLM BBDO, Bolougne Billancourt, by Fred & Farid working as creative director, copywriters and art directors working with agency producers Pierre Marcus and TV producer France Monnet Grasseau. Filming was shot by director Remy Belvaux via Quad Productions, Paris, with director of photography Patrick Duroux and producer Giles Viard. Music was recorded at Barrera Productions, Paris. The Brandt campaign won awards at CLIO 2001, New York Festivals of Advertising 2000, and Cannes Lions 2001.